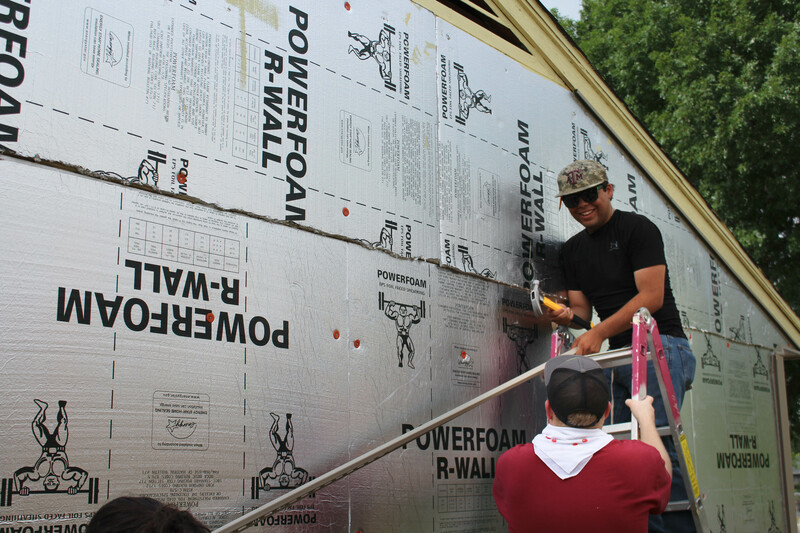 Teenagers travelled to Dallas for the summer, not to shop or catch a baseball game, but to work on remodeling houses. The week of June 12-17 saw three youth groups come to the Metroplex as a part of BOUNCE Student Disaster Recovery, a Texas Baptists Missions program. BOUNCE students worked at three locations in Dallas, which were selected by the City of Dallas’ People Helping People. One of these three homes belongs to 81-year-old Wilma Curry. Curry lived in her house since 1965 and said this was the first time anything had been done for it. One of the teenagers that worked on Curry’s house was Carrmin Ray, a high school freshman from Wylie Baptist Church in Abilene. She had no previous construction experience of any kind, but was happy to work because BOUNCE gave her the chance to build relationships with fellow believers and help someone in need. Ray cited getting to see Curry as her favorite part of the week. “I can see her face brightening every time she comes out,” said Ray. 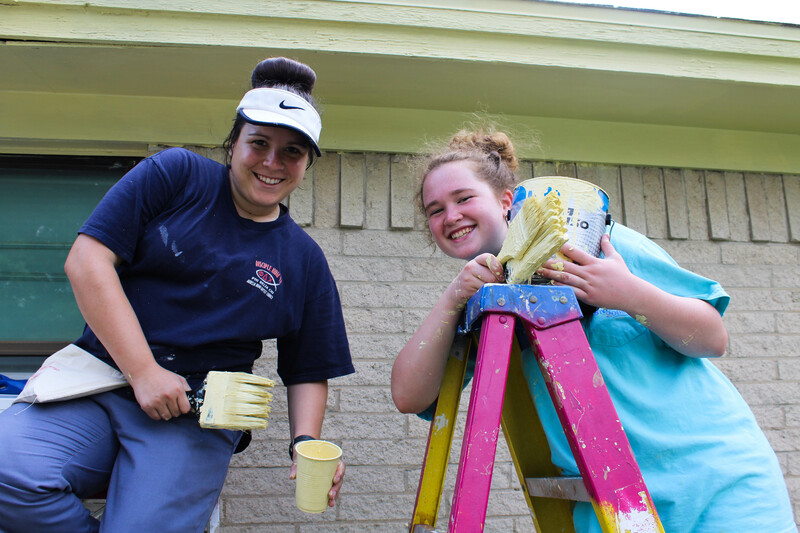 Another Wylie Baptist youth participant was Kaitlyn King, who was excited to have the chance to work with people from other churches, as teens from all three churches were at each worksite. “It was really neat to see how fast the team came together,” said King, adding that she was pleased with how quickly they made progress. King also said she was looking forward to doing more work like this in the future and was interested in joining a local missions group so she could help those close to home. Isaiah Sorensen, from Crestview Baptist Church in San Antonio, was impressed with the group’s teamwork and efficiency as well. He praised God for protecting them, as they had seen no injuries or illness, in spite of the heat and risks of the job. Sorensen is a new believer and said this was his first mission trip. He was very excited to be among like-minded people and was empowered to continue doing work like this in the future, especially after seeing how much it helped the homeowner. “It’s a feeling you can’t get anywhere else,” said Sorensen. Wylie Baptist youth group worked with BOUNCE last summer as well. Jorgensen has served on the Wylie Baptist staff for less than a year, but his students have told him all about their experience, never complaining about the summer heat or the manual labor, only about “how awesome it is.” He knew anything that could get teenagers this excited for missions was something he wanted his youth group to be a part of. In addition to Wylie Baptist, Carmel Baptist Church in Lindale and Crestview Baptist Church in San Antonio were also a part of the missions effort. Dallas BOUNCE partnered with Dallas Baptist Association churches and was hosted by Duncanville’s First Baptist Church, where BOUNCERS gathered for worship and Bible study each evening. Additional BOUNCE mission trips this summer are also planned for Bartlesville, Oklahoma; Baton Rouge, Louisiana; Jennings, Louisiana; and Waco. For more information on BOUNCE and how your student ministry can get involved, visit texasbaptists.org/bounce. Courtney Reeves, a student at Baylor University, is serving as a writing intern for Texas Baptists.